Well I meant to get this picture up much earlier, because I think I actually wore this at the beginning of last weekend, but you know how it goes - life never seems to go as you plan. The point of this post is to show off my favorite new purple, MAC's Violet. I know I'm the purple queen (my roommate teases me about it in fact) but I swear each one I have is in actuality different. Maybe not a lot different, but they're all different. What's so amazing about this one is as vibrant as it looks in this picture? That's how it looks in real life. It's not a matter of flash or nice angles; Violet is really just that amazing. I tend to use something like NYX's Jumbo Pencil in Purple underneath, just to give it something to stick to, but the color doesn't need the enhancing. It's almost like anything I do still has it look amazing. And since I got it at the CCO at Potomac Mills it's still in the old larger packaging, so I'm going to have this color for a LONG time. Thanks goodness (though for the rest of you out there Violet is a permanent color, so it shouldn't be going anywhere any time soon). If I remember correctly I probably used MAC's Soft Brown to soften the line in my crease and then my new shadow Graphology (which is LE) to deepen the outer V. I could have gone quite a bit darker and added in some black, but when I'm going out in the day I try to keep those tendencies under control (smile). Hope you enjoy! Does indeed look beautiful! AND it looks like it needs to go with my nailpolish!!! Oh so you've decided to keep the polish now? your lashes are to die for!! 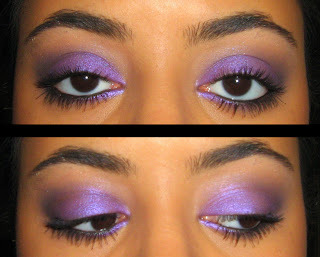 i have the nyx jumbo pencil in purple, too : ) love it, purple's my favorite color. i'll definitely have to pick this up from MAC. the way you darkened the v is nice and subtle too! Thanks!! Those are purely the result of my Rimmel mascaras but I appreciate you noticing!